Will 2012 be the year for layer cakes? I don’t know, but I’d happily embrace that trend if it were to catch on. So let’s hope for a year of exciting and/or really good cake recipes. Until then, here’s a round-up of my current favorites. 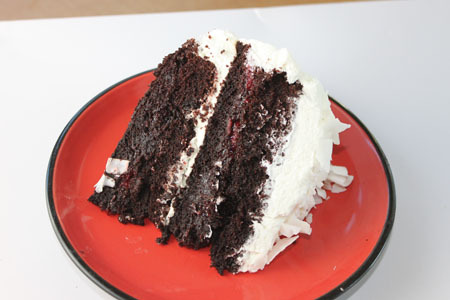 This Chocolate Cake with Raspberry Filling and Sour Cream Frosting was fun to put together and a big hit with the family. The frosting is a little unusual, and very good! Perfect yellow cake takes more attention to detail, so a lot of people just turn to cake mix, including the people at Bon Appetit, who did a taste test of favorite box cake mixes. The taste test was helpful, but by no means should you give up on making a perfect scratch yellow cake if you haven’t done so already. If your goal is to master a truly light, tight-crumbed, soft yellow cake, 2012 is the year to try Shirley Corriher’s Yellow Cake or CI’s Yellow Cake. 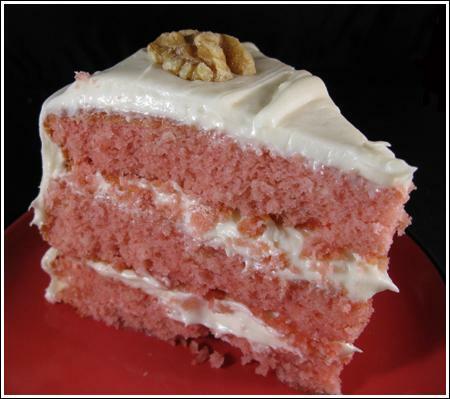 If you like the idea of a homemade strawberry cake, here’s a beautiful pink, scratch Strawberry Layer Cake. 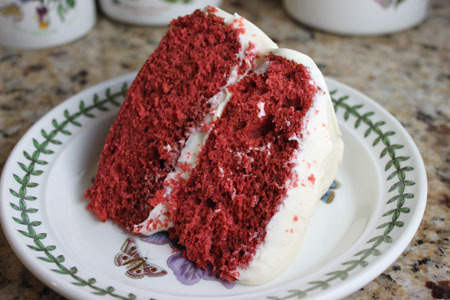 But if you’ll take red over pink, Red Velvet Cake is the way to go. This is our family’s current favorite. And then there’s Italian Cream Cake — easy to forget about, but always a crowd pleaser. Hummingbird Cakee, which is a combination of banana and pineapple, always goes over well. This is the recipe I like. 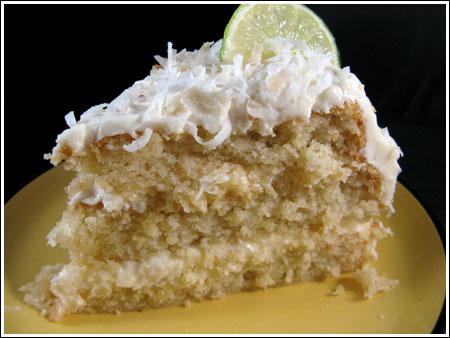 But if you’d prefer coconut cake, try Pineapple Coconut Layer Cake. The seven minute icing makes it special. 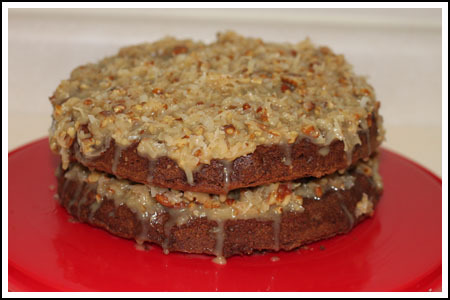 People around here really like this German Chocolate Cake, which I make with two 8 inch layers. It’s small, so it’s more suited for the family then a big party. 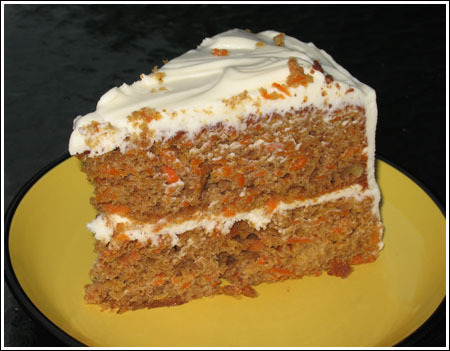 And when it comes to carrot cake, this Carrot Layer Cake is pretty reliable. I’m still trying to find a recipe similar to the one served at Gibson’s in Chicago, with lots of dark brown sugar and a crumbly texture, but this one is traditional and very good. 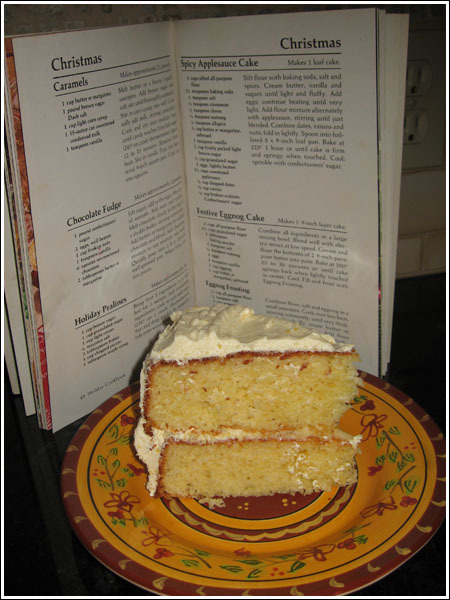 Eggnog Layer Cake from an old Baking with Julia Waldbaum booklet. 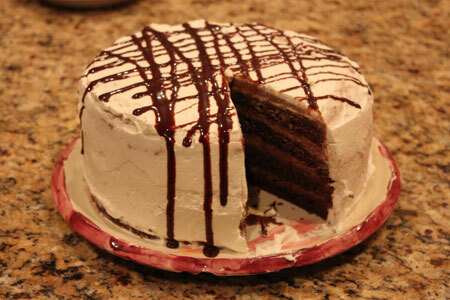 And this Irish Cream Chocolate Layer Cake is also pretty festive. But if you are looking for something more summer-y, this Key Lime Layer Cake might be better. Those are my top layer cakes for now, but I’m hoping to add to the list this year. For chocolate cake, here are some other favorites. I didn’t have any Jello & only have two eggs. Will have to wait until I can get to the store. Darn! Making artichoke dip instead. Yum! Tracy, were you really all over cake balls? I’d like to hear more about that. I know Angie made them super famous, but I imagine the recipe was around long before she perfected it. I’d love to know who got the idea to mash up cake and dip it. I’m At Home Baking — I was in the same boat until I found CI’s recipe (and Shirley’s). I think the method they use is a variation on the Two Stage mixing method. Carol, I’m so glad you liked the strawberry cake!! Cotton Foozy, that’s my kind of resolution. Sue, I hope you do a monthly chocolate cake. Let me know so I can link to it for your review. Louise, I believe the cake you linked to is the same one I mentioned above and linked to in the post. Martha, how’s the strawberry cake coming along??? Happy New Year to you in Kansas City. I read this article yesterday & wondered what would happen to all of the cupcake shops, some of which just popped up in KC this year. It was exciting to hear that Kansas City is finally going to be recognized for all of its wonderful restaurants. Hope everyone comes to visit my birthplace & be sure to check out the ‘burbs on the KS side too. I think I have all of the ingredients for the Strawberry Cake – off to check. Happy New Year! I forgot to mention that in my opinion, the Dominican Cake is the perfect Yellow Layer Cake. 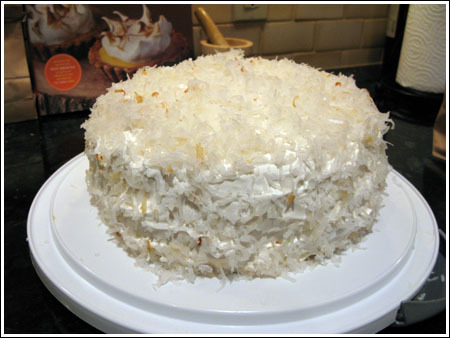 One of my very favorite layer cakes is http://www.epicurious.com/recipes/food/views/Pineapple-Coconut-Layer-Cake-10154 from a 1995 Gourmet. It’s a very light cake and not overly sweet. 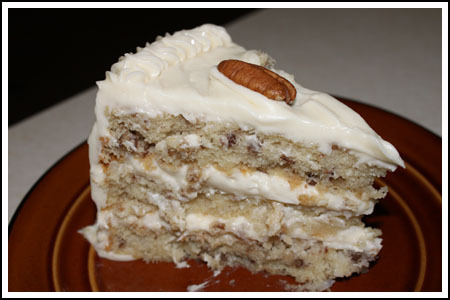 I know it as “Dominican Cake” as we can buy something very similar at our local Dominican bakeries. For the filling, I use 20 oz. of crushed pineapple and a little more than 1 Tb cornstarch. Everyone raves about this cake. I love dark chocolate layer cakes with chocolate buttercream, but recently found “The Whiteout Cake” from “Baked:New Frontiers in Baking”. It’s a white cake, but with white chocolate frosting. I’m seriously considering making one of these cakes a month during 2012. 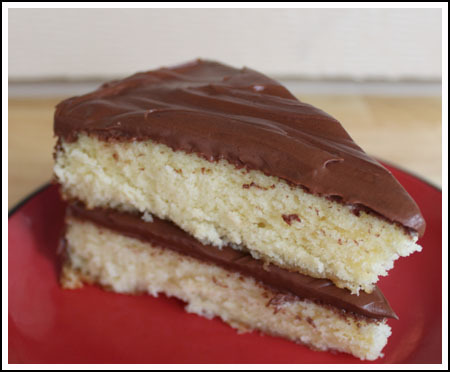 I could add three from the chocolate layer cake list and have a year’s worth of layer cakes!! This post has prompted me to make my very first very important goal for the year 2012: EAT MORE CAKE. Oh Anna, I love layered cake. I once met a women that took the frosting off her cake and said the calories weren’t worth it. She obviously had never had good homemade frosting! That strawberry cake of your makes me happy because I was searching for a Strawberry cake recipe about 2 1/2 years ago and found your blog (the magazine recipe I had seen one in had bad reviews). I had never really seen a food blog before and now I am addicted to them! Plus that cake was great for my birthday. I need to make it again. I am really wanting to try one of the yellow cakes. I have not found a homemade one I’ve ever liked so maybe I will this new year! Wow, those look gorgeous. I’d be all for 2012 being the year of layer cakes. I was over cake balls before they began. Cookie Sleuth, I could say the same about your blog :). Lori, Happy New Year. See ya ’round! Cindy, will do. Their website makes my head explode (in a good way). Katrina, it’s also the year of meatloaf. Hope your sheet cake turns out. My favorite banana cake recipe is my grandmother’s sour cream cake (the one from her funeral), but I always make it as a Bundt cake so it didn’t qualify for the list. Very nice post! I have pretty much given up on yellow cake in favor of white cake. White cake seems to come out better for me. You should check out the recent King Arthur blog post about the perfect homemade yellow cake. That’s an IMPRESSIVE list!!! Better than any list I’ve seen in food magazines!